Friday nights are long days for me now. I pick up a little overtime on Friday nights in the fall due to an increased work load at work. I don’t mind it. I actually enjoy the work I do on those nights so it’s really not a big deal to work my regular shift all day then get spun on to something fun at night. I don’t get much of a chance to eat dinner so I’m always looking to pick something up on my way home around 10:00. I like to find pizza places still open but they all seem to close at 9 or 10, so I usually end up at Taco Bell. My job assignment this past Friday was in Kalamazoo so that was going to leave me some more options for late night food. 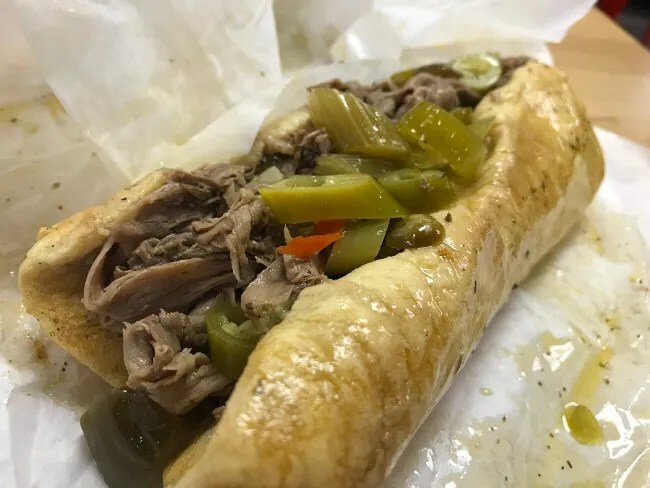 A new place near campus just opened and they advertise Italian beef….so you know where I was going for dinner, right? 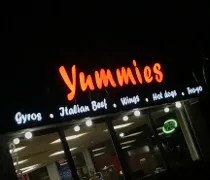 Yummies is on Michigan Avenue just to the west of Howard Street. It’s in the old Wendy’s building just outside the Campus Pointe Mall. The square building still pretty much look like Wendy’s but with a new paint job to get away from the chain fast food look. The store is very much set up like the old Wendy’s design. 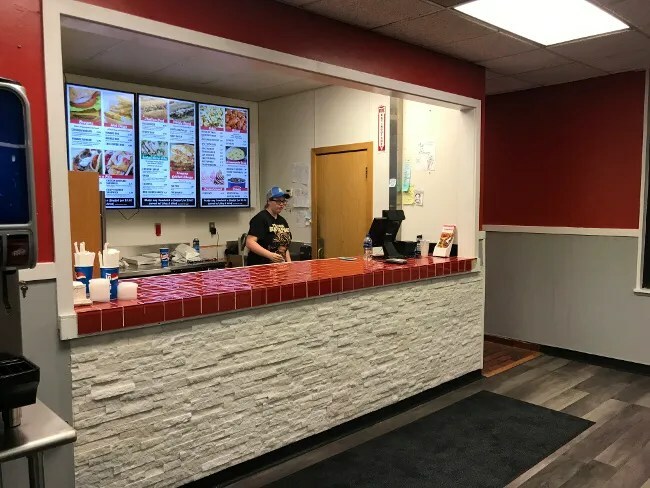 There is an order counter near the back of the space separated by a wall with condiments and napkins from the dining room. While the layout of the place hasn’t changed much, the design has. The owners of this new restaurant really put a lot of money into the flooring, wall treatments, and furniture. 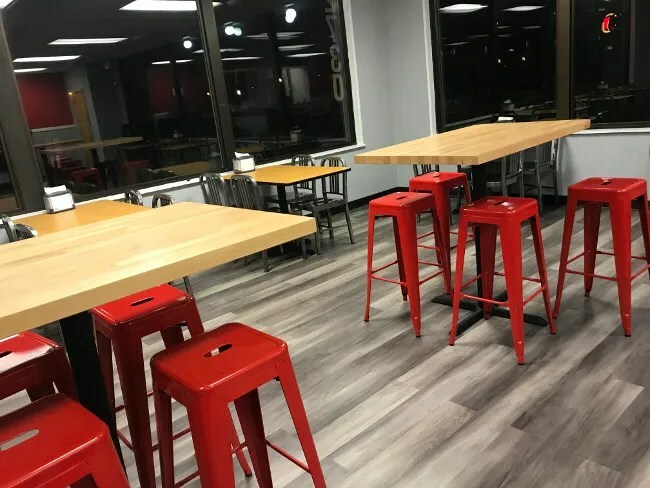 While some of the tables look repurposed, the higher, pub style tables with metal pub stools give it a different feel. The laminate wood floor is also quite a change from the days of this being a greasy fast food chain. The menu is kept pretty simple to mostly just sandwiches and wings. 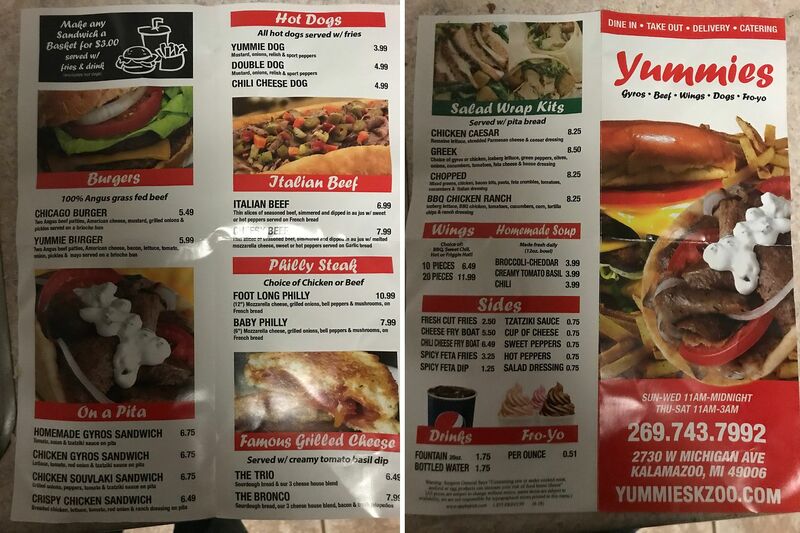 They have burgers, dogs, gyros, Philly’s, grilled cheese, and Italian beef. It’s all good drunk food or something tasty sounding when you just don’t want to eat a salad. I ordered the Italian beef with hot peppers and dipped. The sandwich was very spicy. The thinly sliced beef was dripping with the au jus. The hot giardiniera on top was mostly green veggies but there were a few pieces of carrots and red peppers mixed in. I typically prefer more of a veggie variety, but there was just enough to make the hot pepper mix good. The thing I wasn’t a huge fan of was the bread. It’s a long french roll but it seemed too soft for me. It didn’t hold up well to the gravy and actually seemed to repel it instead of soaking it in. The bread is not a deal killer by any means but if I had was to change something on this sandwich, the bread would be it. I made the sandwich a basket for $3.00 which added on fries and a drink. They have Pepsi products on the fountain machine so I grabbed a Mountain Dew on my way to sit down. 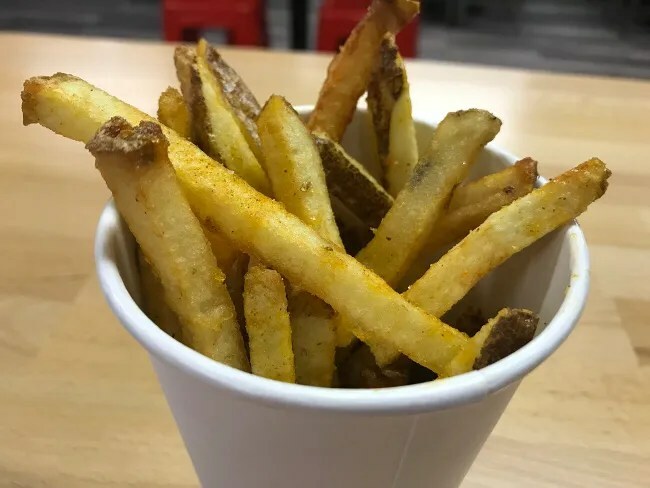 The fries are the kind of fries I really love. They’re skin-on fries with a crispy brown exterior, a soft, flaky middle, and they just hang on to the grease. These could have been a little crispier but I really didn’t mind. They’re the kind of fries you get in a good Chicago sandwich shop. The cost of my meal was a little over $10 and it took less than ten minutes for my number to be called. I was a little surprised the place was essentially empty when I was there but it’s new and it was still fairly early (by college standards) on a Friday night. They’re open until 3:00 weekends to serve that after the bars close crowd which is a great play. 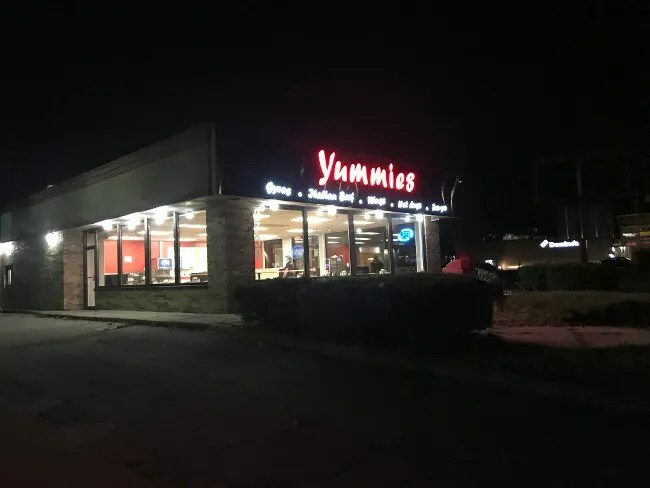 Yummies is different from a lot of the fast food we have in Kalamazoo. The place is really reminiscent of Chicago neighborhood sandwich shops that serve up quick, tasty food. Just based on one experience, it’s not going to be the best thing you’ll put in your mouth but it is pretty “yummy.” I really like the location and the late night hours. I don’t think this will be my last stop at this new addition to the WMU restaurant scene.